Welcome to our new online shop. We ship worldwide (shipping will be calculated when you check out). Payment is accepted through Paypal. You can pay with a credit card even if you don't have a Paypal account. Please contact us for support or pre-sales questions. Size: 26HP, 37mm (1.46in) depth behind panel. The currect wait time is stock to 2 weeks. 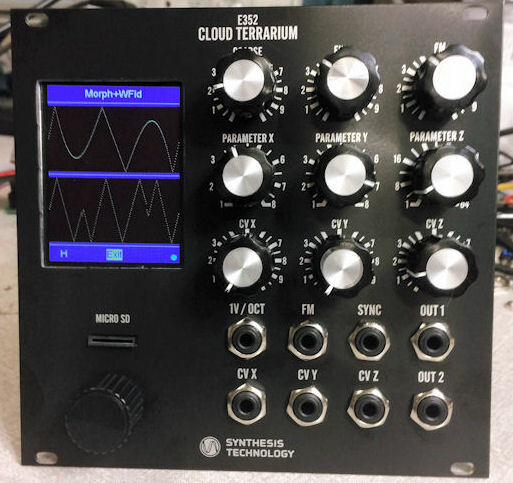 Black panel version of the E352 Cloud Terrarium, available only from Synthesis Technology. If you prefer a plain aluminum panel, you can purchase through one of our Dealers instead. $469 plus postage. The postage will be calculated when you put in your address. Please note: you will receive a single email, from the PayPal site, that your order is accepted. Lowest noise Euro passive bussboard. 16 shrouded connectors, interfaces to supplies via M3 barrier strip. $99 free postage in USA. Cart will calculate other countries. Estimated ship is stock to 2 weeks.